What is the "Mentor" system? The Mentor Model is designed to enhance the learning and understanding of specific concepts and requires candidates to interact with instructors in a structured environment through specific exercises designed to enhance the course material based on an individual candidate’s needs. This Mentor Model will be available for those who need the additional support and guidance; those seeking academic credits for the coursework and professional development credits. The Mentor Model will be provided through a synchronous and asynchronous threaded discussion board forum. If you are required to complete an additional component, you will be notified by either your organization or by us. If you are required to complete the additional component, you are assigned a "Mentor". To complete the component, you will be required to enroll in it as a standalone exercise. This will be made available in the main course catalog. Once you enroll, you will be provided with your tasks which may take the form of quizzes; essays; questions; readings; podcasts or other audio and video. 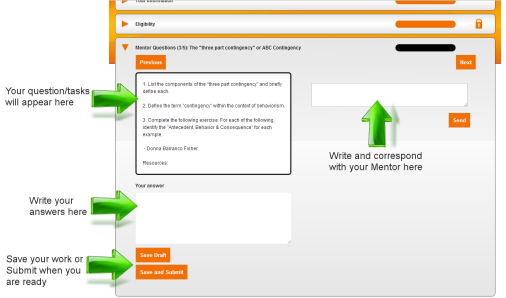 You will enter your answers directly on screen and also be able to chat with your assigned mentor. Once you have successfully completed the required tasks assigned by your mentor, it will be marked as "Passed" and completed. Yes. The additional component is imposed by organizations or accrediting bodies and is not governed by CoAHS. However, where the use of the Mentor system is a part of a program by CoAHS and not an additional requirement, then there is no additional cost.